July is here, and we're well into the summer grilling season! For most of us, grilling season is filled with yummy hot dogs, hamburgers, brats, sausages, and any other kind of meat you can think of. But it's important if you're hosting a grilling get-together that you keep your guests' dietary needs in mind, too. Veggie cuisine doesn't have to be boring or difficult to accommodate. Today, I'm sharing my recipe for a no bun, roasted garlic and quinoa burger--a solution for guests who prefer veggie burgers and don't eat bread. One of my closest friends, who prefers veggie cuisine, says it's hard for her to enjoy the summer BBQ season mostly because hosts often neglect her dietary concerns. When she told me this, it made me really sad and I promised her I'd come up with a fun, delicious meatless grilling recipe for her and her friends to try out at upcoming BBQ and grilling parties. Meatless grilling can still be delicious! Don't leave your veggie loving friends to fend for themselves at a BBQ! Serve up this no bun, roasted garlic and quinoa burger as an alternative to regular hamburgers (or other grilled entrées). 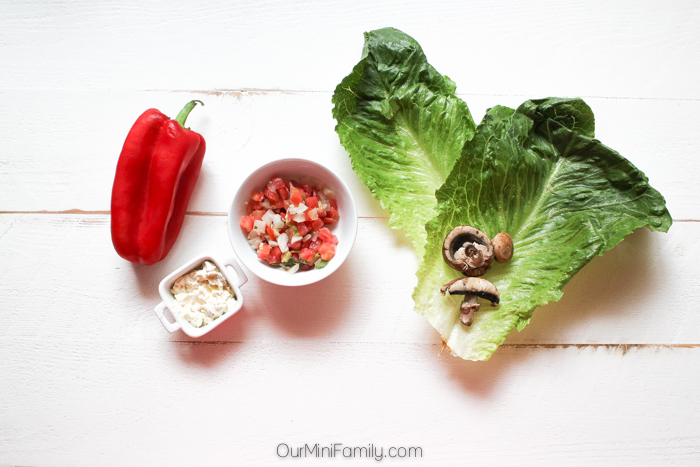 Wash and prep your romaine lettuce, red bell pepper, and mushrooms. Place mushrooms in aluminum foil and heat on the grill. Grill your Morningstar Farms® Roasted Garlic and Quinoa Burgers to your desired wellness. 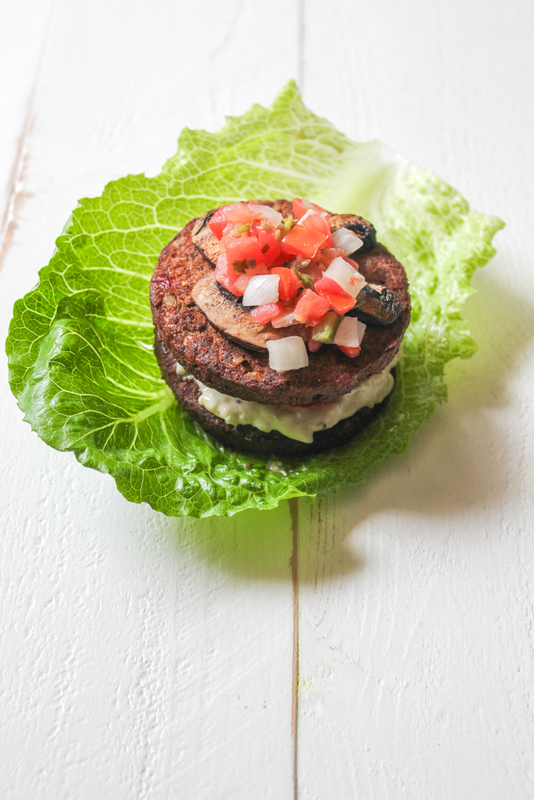 Begin stacking burger starting with one slice of lettuce, followed by one burger, a layer of artichoke jalalpeño dip, a red bell pepper slice, another burger, and top with grilled mushrooms and pico de gallo. Top off burger with the second piece of lettuce, creating a no bun burger you can hold and eat! 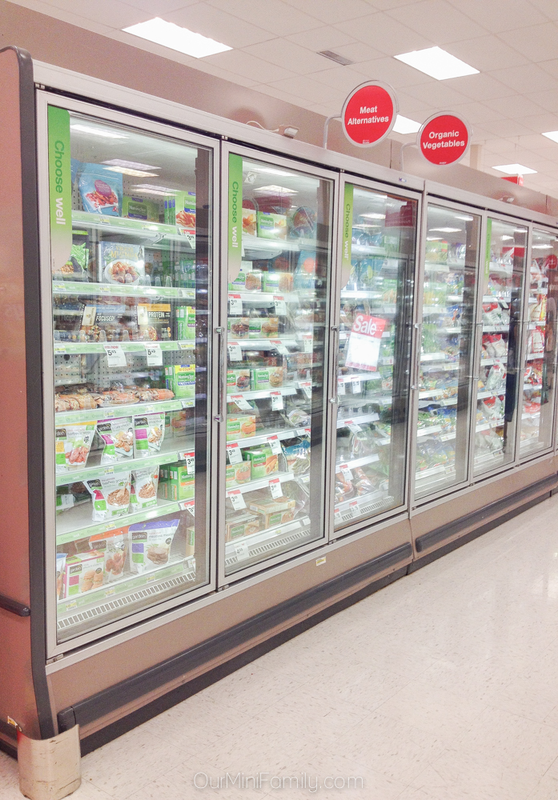 Save 20% on MorningStar Farms products at Target through the Cartwheel offer, available 6/8-7/4. You can go meatless for a number of meals when you select Morningstar Farms at Target, and you can partake in the Veg of Allegiance Program (and enter to win for a chance at some awesome prizes, too)! Be sure to check out the Veg of Allegiance Program, as well as more recipes that put a fun twist on grilling at the Morningstar Farms site here. Have you eaten a veggie burger? That actually looks really tasty! Crunchy lettuce is a perfect substitute for a bunk and it's so much healthier for you. Will have to see if our local store carries these burgers. Yes! I love having lettuce in substitute for sandwich buns a lot! I love veggie burgers! I am not a vegetarian, although we do have one in the family :) I often order veggie burgers when we are dining out. I rarely make them at home. I think I am going to try this Roasted Garlic and Quinoa Burger! Thanks for the deal, too! I am a Target shopper! I definitely prefer potluck style BBQ's in the summer so I can guarantee at least one thing on the menu fits what I eat! Or I like to host BBQ's so I can make sure there are lots of yummy foods that fit my diet needs! That's great, Julie! I love potluck style BBQs as well. This looks awesome. 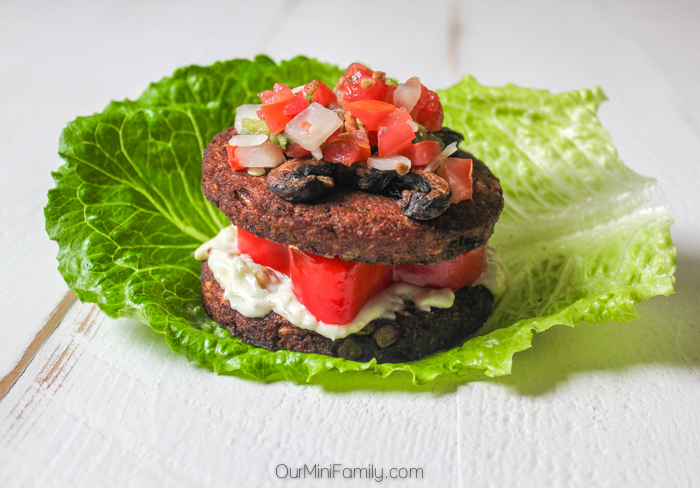 I haven't tried the quinoa burgers yet but they look delish! Wow, I love the toppings you used for this burger! I definitely want to try these now! We love burgers, but we've been trying to eat healthier. Thanks so much! And I know what you mean--I've been struggling to eat healthier this summer as well. These burgers are perfect for me! Aww thanks Donna! I just try to treat my friends the way I'd want to be treated :) And I am a sucker for lettuce wrapped burgers as well. It's always been my go-to when either a) I want to eat healthier or b) we're out of hamburger buns! I've eaten veggies burgers before but not like this. I like the no bun option, as it helps in reducing carb intake. Totally great for someone watching out for carb intake--you are so right! I really need to try these, I've heard so many great things about them! Thanks for the tip on the coupon, I'll have to use it to pick some up next week! Totally! I hope you do! This looks really yummy! I'm trying to do less bread in my diet so this would be perfect! Having less bread in a diet is definitely difficult, but this is an easy way for me to do it for sure! that looks delicious. lettuce wraps are always a great option!! i feel like it's good to change it up whether its for a dietary reason or not! i love anything grilled though. Thanks so much! I completely agree. I have always been a little scared of veggie burgers, but this one looks amazing! Love using lettuce as a bun! They are so good! You should for sure try one. Not something our family would try, but it does look good. I have friends that absolutely love Morningstar Farm's products! This looks so good My family uses lettuce instead of buns on our burgers to cut carbs all the time. 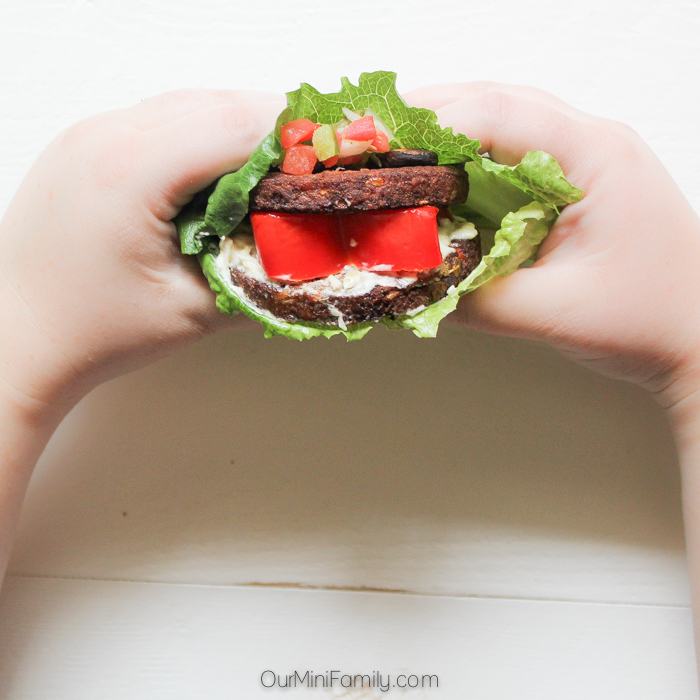 I love MorningStar Farms veggie burgers! Unfortunately, I've never tried the quinoa. My sister had a severe allergic reaction to quinoa recently, and I don't want to take any chances! We do eat meatless on Mondays and veggie burgers are often on the menu! This looks so tasty! 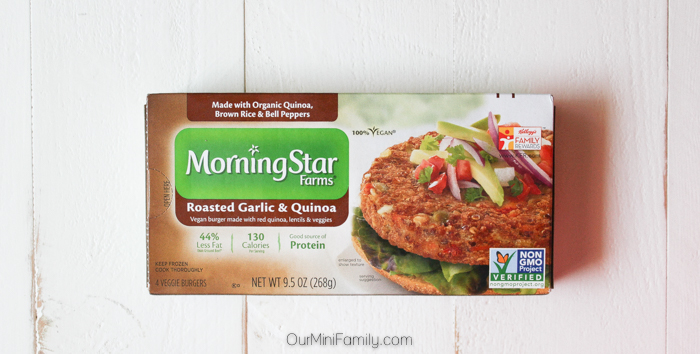 I had no idea that Morningstar Farms made Quinoa Burgers...that is until now :) I'll definitely be looking for them so that I can make your recipe for No Bun, Roasted Garlic and Quinoa Burger!